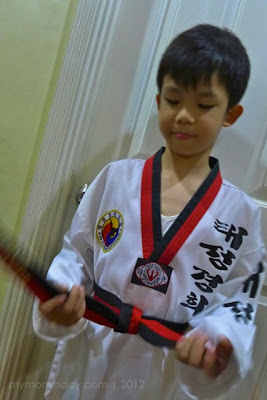 2010: "My Nintendo DSi addict son got his yellow belt in taekwondo yesterday and said... Daddy, I leveled up!" 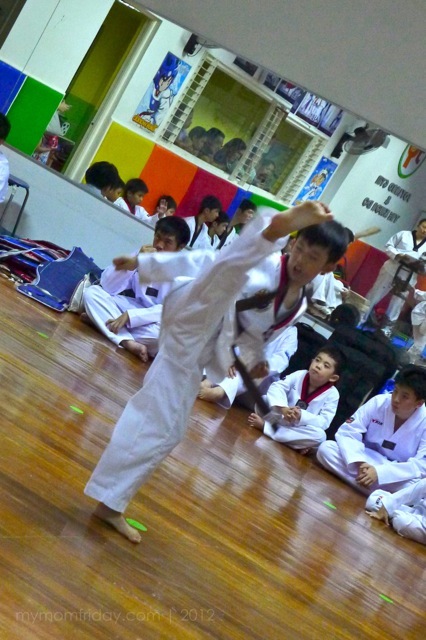 This was the Facebook shout-out of my husband on May 30, 2010 after the boy got his first colored belt from his taekwondo summer class. Two years later, he got his Black! 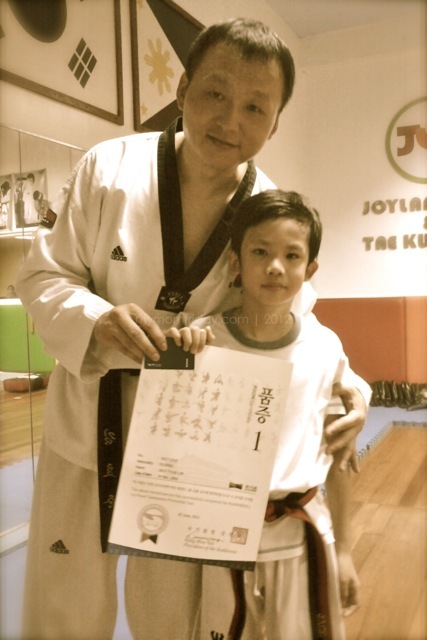 After earning his Black Belt for below 15 y.o. 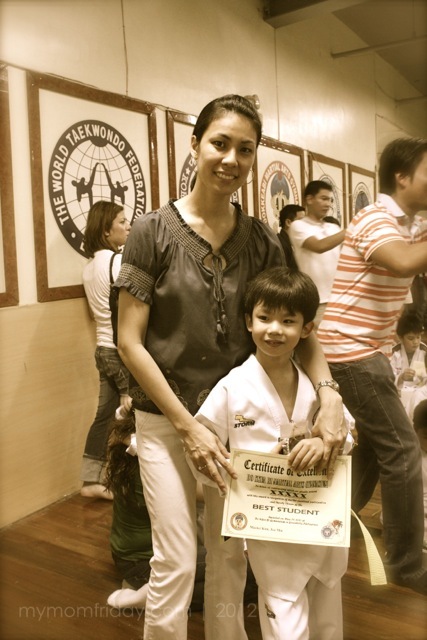 category last May, our boy finally got his internationally recognized Kukkiwon Certificate and ID for Taekwondo 1st Poom Grade level! Woohoo! 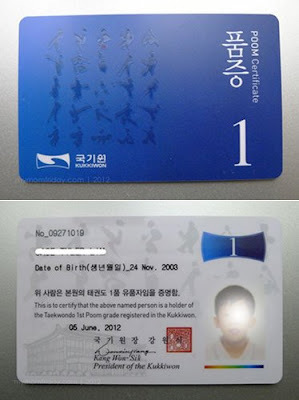 Master Kim explained that this ID is like an SSS ID, with his permanent number, and can be used internationally. The class has ended at 5:30 and just before their closing huddle, a courier arrived and handed an envelope to Master Kim. 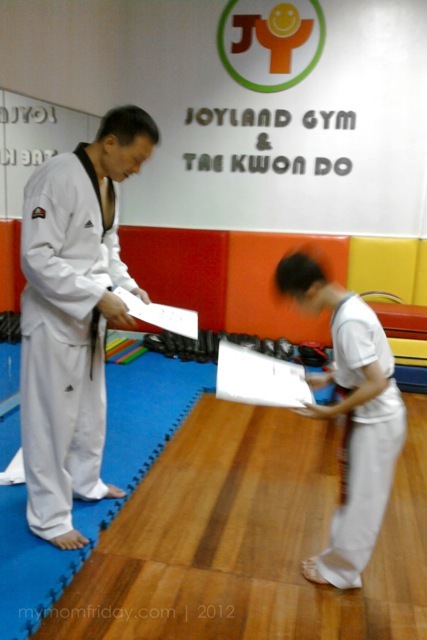 It was what we've been waiting for -- the certificates of the students who were eligible to apply for POOM at Kukkiwon. They were four, including my son. 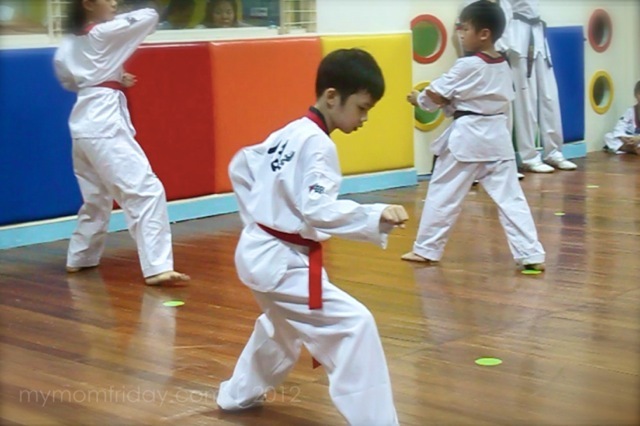 Over the two years of religiously attending taekwondo classes twice weekly, the boy has gone through so many challenges, fears, hesitations, self-doubt, and countless anxieties and crying bouts along the way. 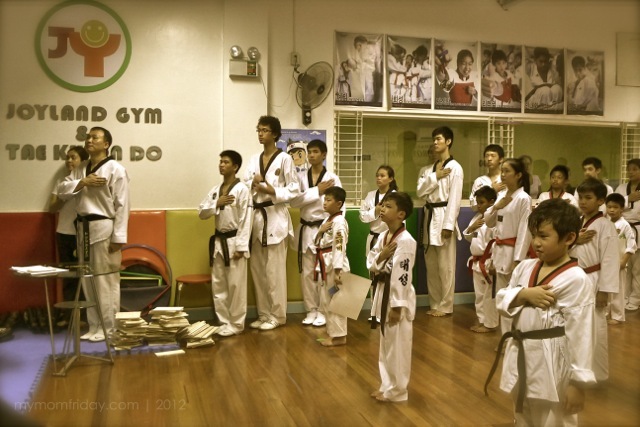 If you've read my taekwondo post here, you'll learn how the philosophies of taekwondo has been an enriching experience for us. So, how did we get to Black? Let's take a look at our journey. This is dedicated to the hubby and to the boy. To my boy, who despite all odds, finally got the Black. But it doesn't stop here. 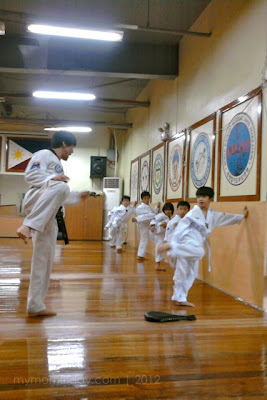 It's been 2 summers ago since the boy took a trial class. He started with beginner's White belt. 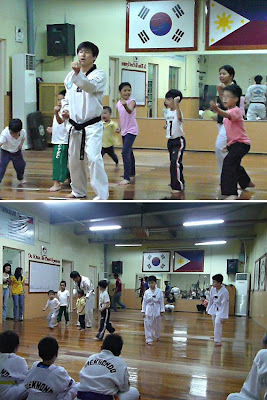 That was in April 2010. 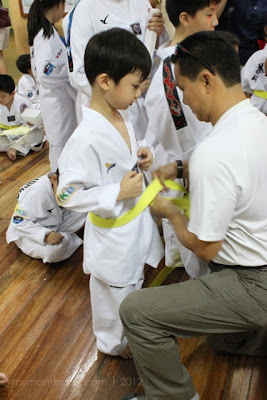 After 20 sessions of taekwondo foundation class, he "leveled-up" and got his first colored belt - Yellow. He was 6 1/2 then. The Yellow belt has two levels, and from Low Yellow, he moved to High Yellow. 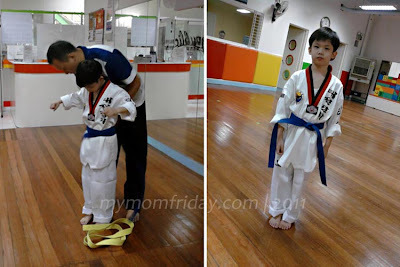 After 6 months, another promotion test and he got to lower Blue. 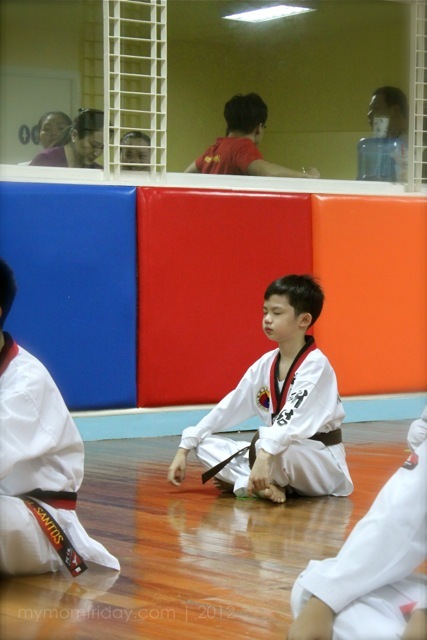 It was during this phase that he began to feel "bored" and "tired". His strength and confidence level also got tested here since he was introduced to sparring. 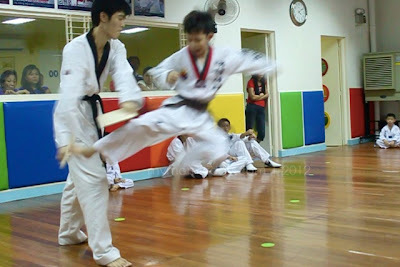 Oh how he hates sparring! 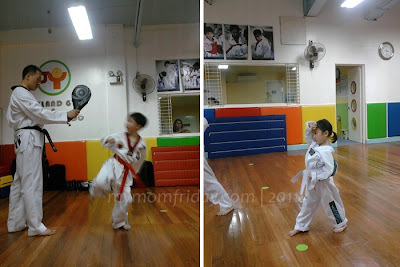 He gets tense and scared every time he's called to spar, especially with boy bigger than him! He had a defeatist attitude. It took a lot of encouragement and praises from us, from Master, and from his friends before he toughened up and faced his "opponents" bravely. Personally, I didn't want him to be promoted to Red. I don't think he deserves it yet. He lacked confidence. 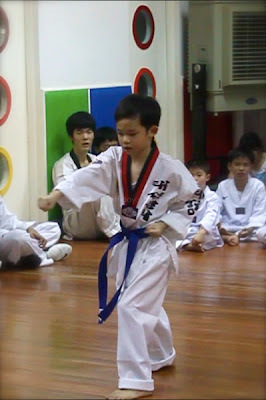 He needs to master Poomsae, and memorize the required number of Taegeuk. Movement patterns are designed for training, skills, and techniques. These 8 training patterns are called Taegeuks - mastery is required to move up the belts. 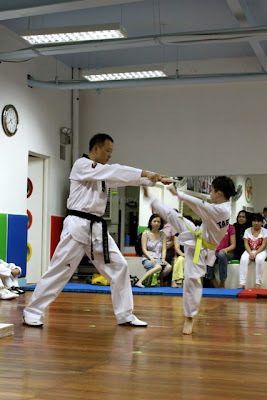 With some practices at home, Master also pushed him more until he got his confidence back. Here's a one-minute video during a class where he was asked to demonstrate (with training weights for the arms) Taegeuk 1 for his lower belt classmates. 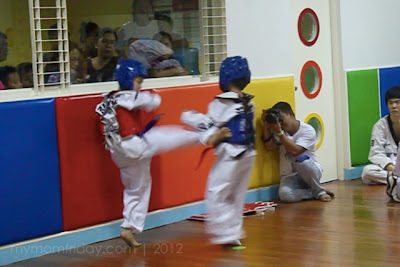 (Notice the girl just having a laugh after the demo). Little sister joins the class too! By the time he got promoted to Brown belt, he was more motivated since he knew there's only 1 color left = Black. 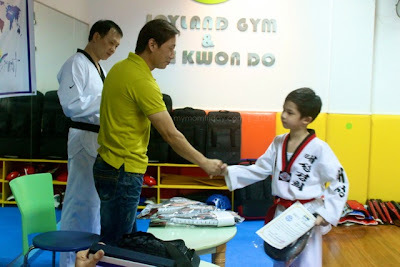 During the Promotion Test last May, he finally got the Black for 'below 15' category - Black with Red belt. The boy is 8. 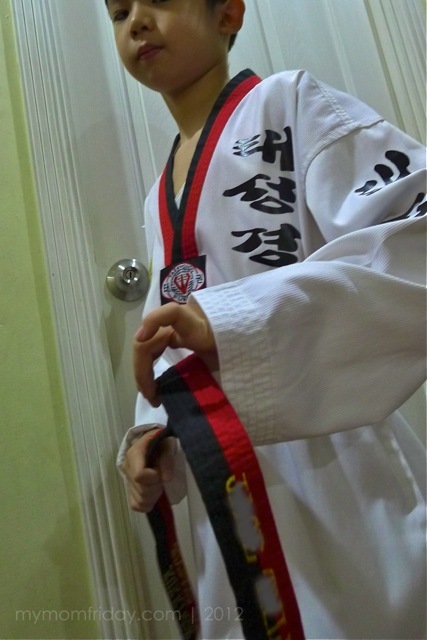 Once he's 15 and has maintained his form and mastery of Poomsae, he can have the solid Black belt and apply for a new certificate at Kukkiwon. With his international Kukkiwon Poom ID, he can participate in any international competition if he desires. During bad days, he still shows signs of giving up and stop going to class since he reached Black already. 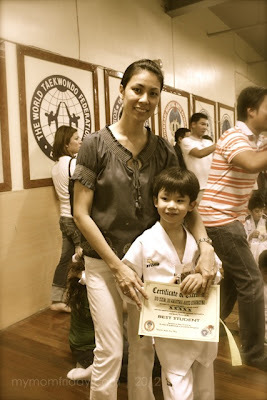 Though we are proud of this great achievement, he's only Poom Grade 1 and still has a long way to go. I told him he has to practice more and master his Poomsae, to prove that he truly deserves the Black belt. It's really hard work. That's life.